The Blake exhibition at the Tate, and the happy coincidence of a BBC Radio 4 serial, produced one discovery of interest, the subject of the hitherto unidentified book illustration in the Bateson Collection.1↤ 1 Exh. Tate Gallery 1978 (255, repr. ); also repr. Geoffrey Keynes, A Bibliography of William Blake, 1921, pl. 25. It is No. 682 in my detailed catalogue of Blake’s works, now in the press. 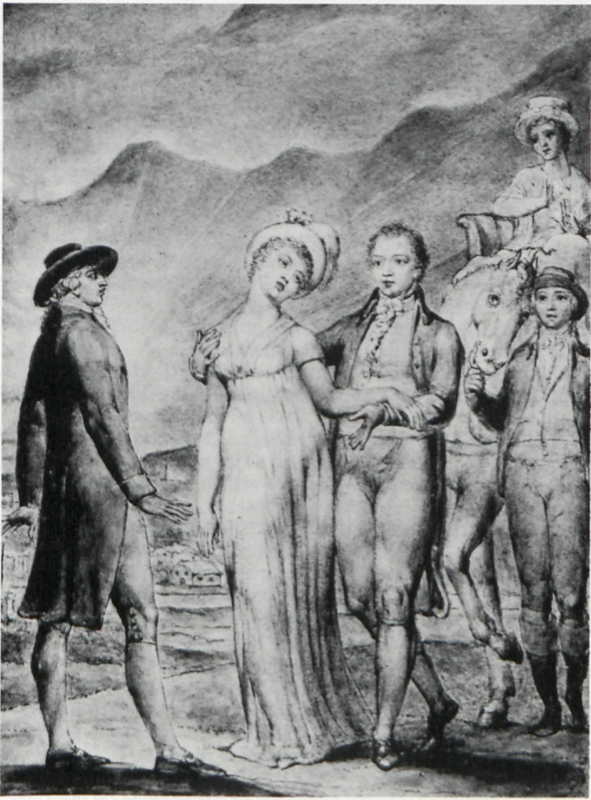 In the “Times Diary” in The Times for 25 May 1978 it was reported that Professor Noel McLachlan of Melbourne University had recognized the drawing as being an illustration to Robert Bage’s Hermsprong, or Man as He is Not, first published in 1796 and again in 1799, 1809, 1810 and 1828. The novel, subtitled to contrast it to Bage’s previous novel Man as He is of 1792, deals with the opposition between Lord Grondale and the radical Mr. Hermsprong, brought up in savage America and a reader of Thomas Paine’s Rights of Man; he is only revealed at the close to be Charles Campinet, the wrongfully disinherited heir of Lord Grondale’s elder brother. William Blake, Illustration to Robert Bage’s Hermsprong, c. 1820. Pen and wash. Bateson Collection, on loan to the Tate Gallery, London.